*To register for a full day, register for AM and PM sessions. Full days include a lunch hour and children will need to bring a sack lunch. • No full day sessions. Children cannot sign up for both AM and PM sessions as the curriculum is repeated and there’s no lunch hour care. Extended care is not available for Kinder Camps. School-age Camps are for children who have completed Kindergarten through 5th grade. Choose either the AM or PM Session, or stay for the Full Day. Extended care consists of supervised play experiences for the children scheduled to stay before or after regular camp hours and is available from 7:45-9 AM, and 4-5:30 PM. Our staff to child ratio will be the same as in camp: 1 adult for every 6 children. In order to ensure extended care for your child, pre-registration is required two weeks prior to the start of camp. Typically, we cannot accept same-day registration for extended care. 12-1 PM extended care included with the price of a Full Day registration. For those children that are registered for only the AM or PM Session, 12-1 PM extended care is available upon request. Please email Aimee at reservations@theicm.org to schedule. *There is no extended care for Kinder Camps. Members of The Iowa Children’s Museum receive a 10% discount on camp fees. What do Full-Day Campers do for lunch? Campers are asked to bring a sack lunch each day. The Museum will provide an afternoon snack. Maximum of 24 students for school-age camps. Maximum of 12 students for Kinder Camps. Our ratio of adults to children is one adult per six children. Registration is closed when camp capacity is reached or 3 days prior to the start of camp. We will maintain waiting lists for all camps at capacity. Is there financial aid available for camps? A scholarship program is coordinated through the United Way of Johnson & Washington Counties and the Community Foundation of Johnson County. The 2018 Summership Program applications are available for summer camps, programs and activities. K-12 students from Johnson and Washington County who are eligible for Free & Reduced Lunch can apply for the 84 available scholarships. Click here to access an application. Registration instructions are located at right (under How to register in our new portal). To get started on registration, click the button beneath the camp. Registrations are processed on a first come, first serve basis in the order they are received. If you have additional questions, contact Aimee at reservations@theicm.org or call 319.625.6255 x216. 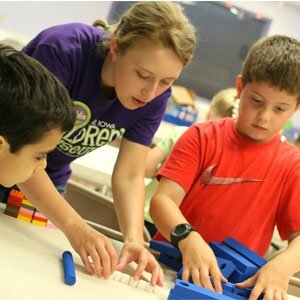 Spend summer learning and playing at The Iowa Children’s Museum! Campers participate in exciting educational activities, explore the museum’s exceptional exhibits, and experience just how fun active learning can be! Register early for these unique educational experiences led by skilled museum PLAYologist Educators. Enter the email address associated with your ICM membership. You’ll receive an email with your log-in information. Check your spam folder if they do not see the reset email. As soon as you log in, you’ll be prompted to create your new password. Follow the instructions and fill in the form fields to create a new user profile. If you’re not a member and do not want to set up a user profile, you can register and check out as a guest. Click “Continue” to continue as a guest. Follow the instructions to register and check out as a guest. Click on any camp to begin. You can add more camps once you’ve started registration. 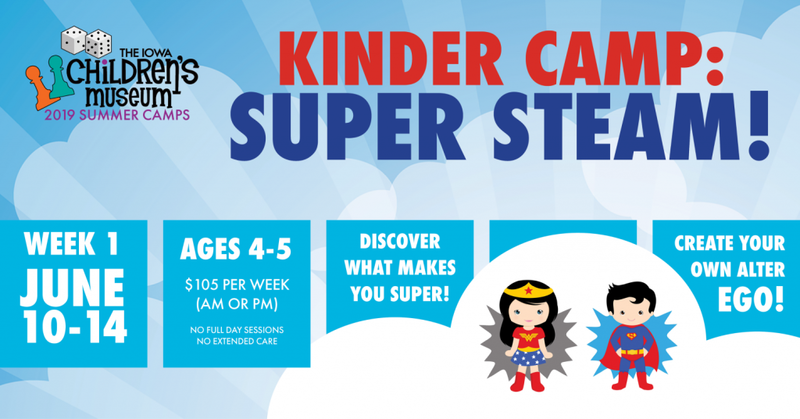 Calling all super kids! Join us for a week of Super STEAM! Explore the amazing powers of superheroes, create your own alter ego, and discover what makes YOU super! Join us for a week of life-sized gameplay! 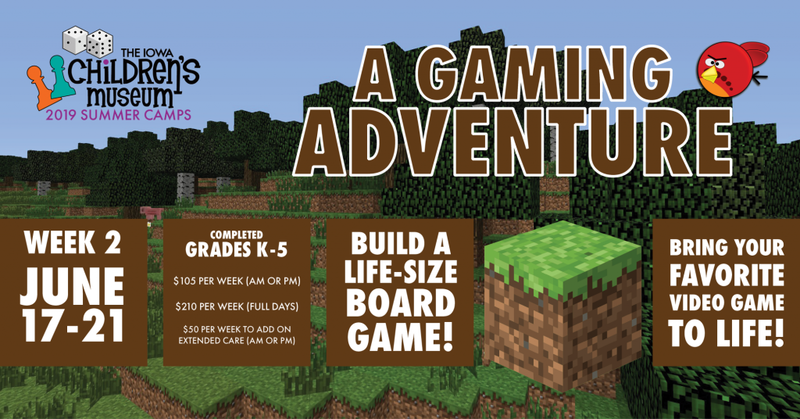 We will bring board games and video games to life by creating our very own game-inspired pieces and playing with them. Each day will be a different game (or two), so don’t miss out on the fun! Experience the great outdoors… Indoors! 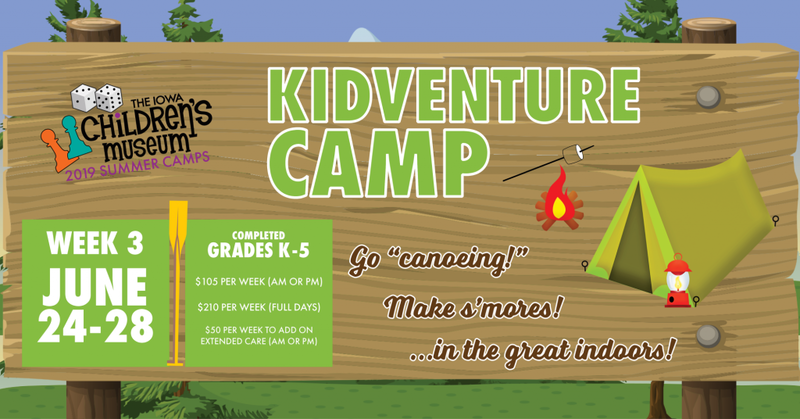 At The ICM’s Kidventure Camp, we bring all the class summer camp activities indoors—from making s’mores to going “canoeing.” No bugs. No sunburns. Just awesome summer camp fun! A kingdom is to be built by The Iowa Children’s Museum campers. 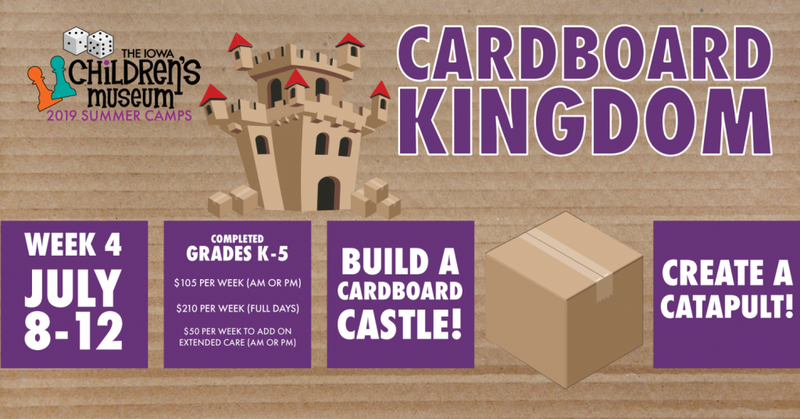 Build castles, create catapults, and make your kingdom rise above the rest! Discover what we can accomplish with cardboard, collaboration, and a little imagination! Join us for a week of wild adventures as we travel across the globe learning all about animal science. 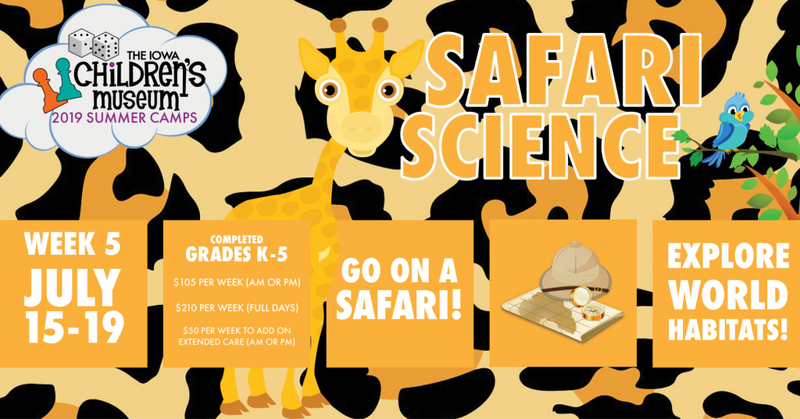 Our expedition will include visits to deserts, oceans, rainforests, and more on our quest to become zoologists! Roll into The Iowa Children’s Museum to ramp up your skateboard knowledge! 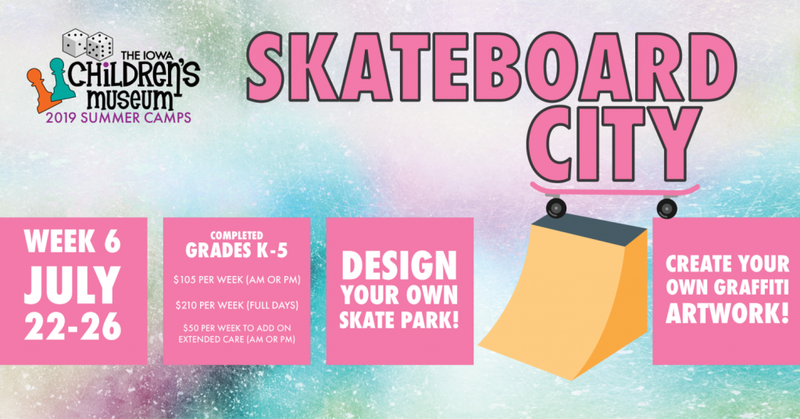 Explore the forces of physics through the science of skateboarding, make graffiti-style artwork, and create your own skatepark. Don’t wipe out before this week full of action, design, and fun! 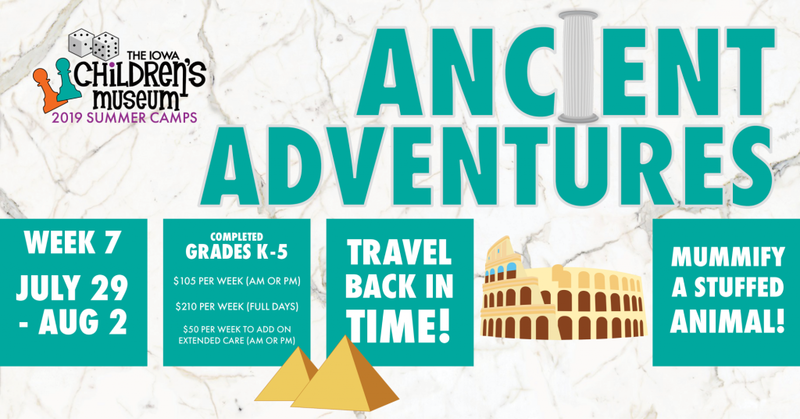 Wanted: Curious explorers seeking adventure with a special interest for traveling back in time. Must be willing to think creatively while making discoveries. Imaginations required. No previous time-traveling experience necessary. 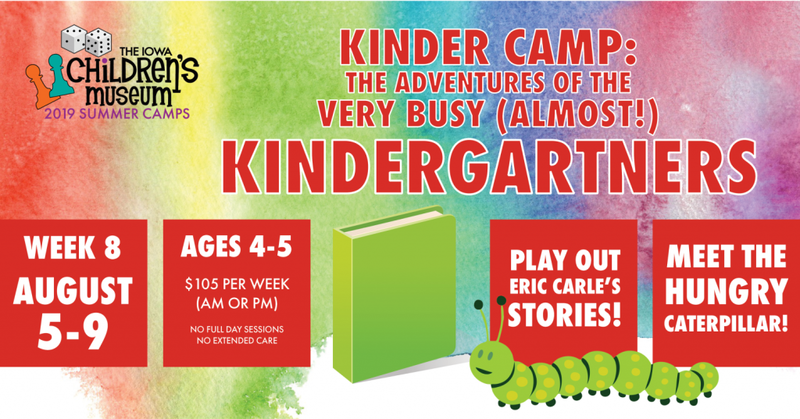 In this week-long camp, we will prepare for kindergarten by learning from Eric Carle! We will bring his classic stories to life in order to play and learn with caterpillars, polar bears, and chameleons—oh my!